BOSTON - Inspiration can come from anywhere. Just ask Dr. Ken Duckworth. He credits a team of Philadelphia librarians with inspiring a toolkit that may save the lives of employees who overdose on opioids at work. Duckworth’s idea was sparked one morning on a road trip, as he drank his coffee and read an article in a Philadelphia newspaper detailing how librarians were administering the opioid antidote Naloxone, commonly known as Narcan, on an almost daily basis in library bathrooms to help users survive an overdose. “I thought, ‘If librarians in Philadelphia can do it, there’s no reason other people can’t do it,’” said Duckworth (above), a psychiatrist and behavioral health medical director for Blue Cross Blue Shield of Massachusetts. The concept is simple: Package two nasal spray doses of Narcan in a pouch along with a surgical mask, gloves and instructions on how to administer the drug. Then, distribute the $130 toolkits free of charge to companies in industries where the rate of opioid overdoes is the highest. Hundreds of those kits will go out to a select group of Massachusetts workplaces under a Blue Cross pilot program launching today. Blue Cross also will provide employee education and training, including an online opioid resource center that will offer info on medication safety, pain management, treatment options and other related information. Partnering with the Massachusetts Department of Public Health, the nonprofit insurer also will provide an expert in naloxone administration so the participating employers can train their own in-house trainers. “The idea is to give people information and training on what essentially is a first aid tool,” says Duckworth, who is also medical director of the National Alliance of Mental Illness and an assistant clinical professor at Harvard University Medical School. Having that toolkit available, he says, can shorten the time it takes to administer the lifesaving drug by putting it where it’s needed — in the workplace. Seventy percent of Massachusetts residents believe Narcan should be widely available in workplaces, according to a new opinion poll released today by Blue Cross. The drug crisis is hitting the workplace hard: More than 70 percent of employers surveyed by the National Safety Council last year reported experiencing absenteeism, overdoses, drug sales or other instances as a result of on-the-job prescription drug abuse. That has resulted in rising insurance costs, more-on-the-job accidents, and lost productivity for businesses, said NSC senior program manager Rachael Cooper. The crisis has left employers eager to help their workers, but feeling as if they lack resources to do so, she adds. The 2017 NSC survey found that almost every industry, from transportation and the service industry to professional sports and others, have been affected by opioid abuse. But the impact of the opiate crisis has been especially evident in the construction trades where painful injuries can result in treatment that includes legally prescribed opioid drugs, in some cases leading to addiction, Cooper noted. In Massachusetts alone, 20 percent of those who died from opioid-related overdoses from 2011-2015 were employed in the construction industry – 1,155 of the 5,580 deaths. Approximately 2,000 opioid deaths occurred in 2017, a massive increase over the prior five years. “We need to replace the sort of ‘gotcha’ mentality that companies have about drug addiction and turn to a truly successful rehab model,” said Michael J. Wright, director of health, safety and environment for the United Steelworkers union, which has an emergency response team that provides counseling and assistance to workers and family members when someone is injured or killed on the job. The union also is looking into providing Narcan to jobs sites to deal with overdose issues, Wright said. 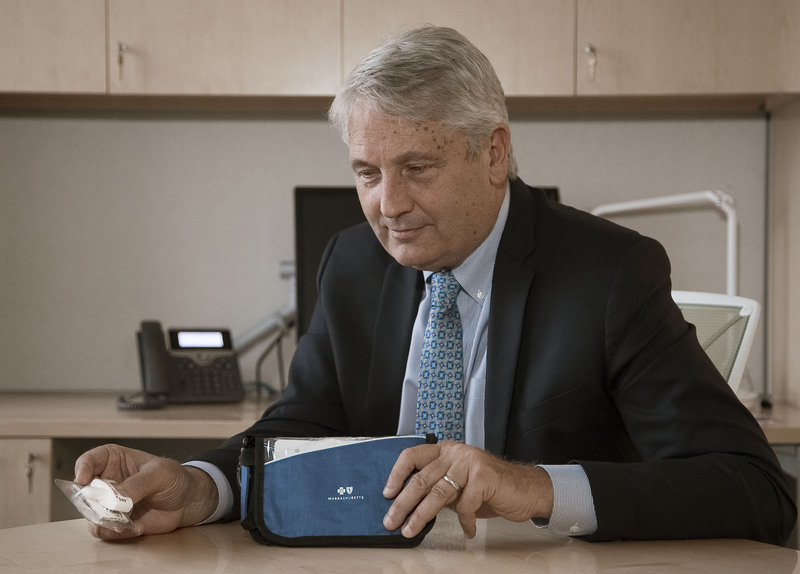 In Massachusetts, Shawmut Construction, the New England Regional Council of Carpenters, the city of Brockton and the town of Ware, as well as Blue Cross itself will be among the first employers to stock the Blue Cross Narcan toolkits under the new pilot program.